Conventional wisdom in our industry says that it pays to have a good reputation, as people are more likely to buy products and services from companies they trust. But does a good reputation really lead to a better profitability? We decided to check this out – and we started by looking at the UK market. 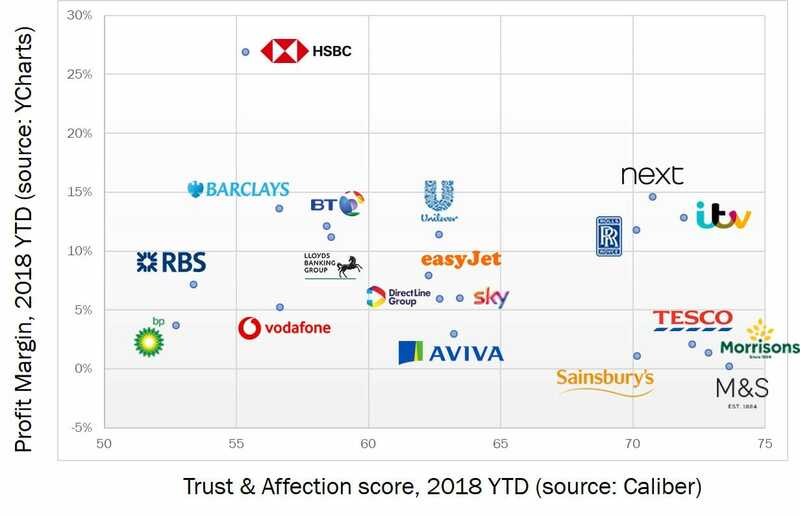 When we examined the most well-known FTSE100 companies, and compared their respective year-to-date reputation scores with their year-to-date profitability figures, we were hoping to find a nice upward-sloping regression line indicating a positive linear relationship between these two things. We didn’t. Instead, we found that some of the country’s most trusted and liked companies, lime Morrisons and M&S, were also the least profitable ones – while a company like HSBC was one of the most disliked and untrusted, but also the most profitable. Does this mean the conventional wisdom is completely wrong? WHAT DO YOU THINK EXPLAINS THE CHART ABOVE SHOWING NO CORRELATION BETWEEN REPUTATION AND PROFITABILITY? ARE THE TWO IN FACT DISCONNECTED? Write your comments below, and stay tuned for our follow-up after the London debate! I think that companies can get away with bad reputation to certain extent, if they offer good deals that “compensate” for poor experience otherwise. Just think of low cost airliners, local car rentals, discount supermarkets and more. It depends on how one defines “reputation” and “profitability”. If we look at long-term rather than short-term financial indicators, there will be a stronger link between stakeholder satisfaction and bottom-line results. In the long run a company with bad reputation will lose customers and market share, and become unprogitable.